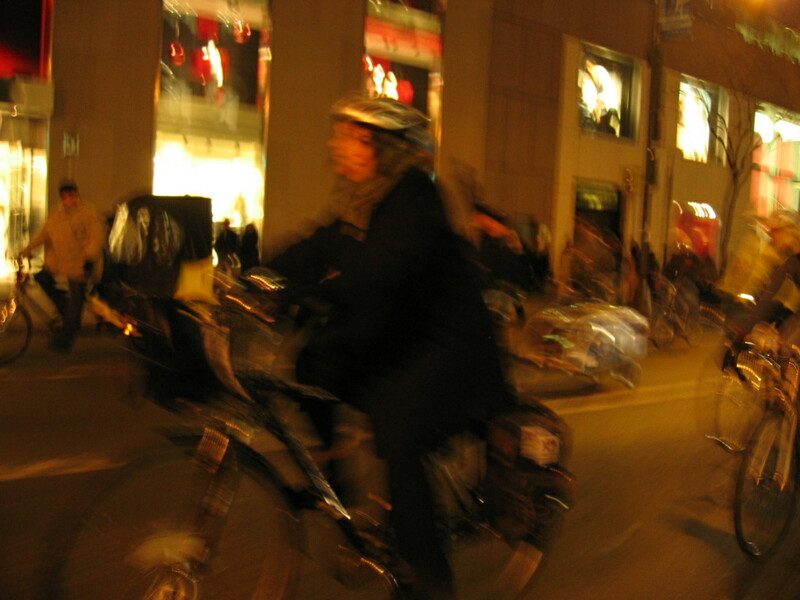 BikeBlog: Oh what fun it is to Ride...when there's a transit strike. Oh what fun it is to Ride...when there's a transit strike. It's rather sad that it takes a strike of a large labor union to turn this city into a venerable paradise for bike riding. Some how the president of the MTA was trying to make concessions to the workers but in the last minute of the deal slapped them with a 6% premium increase on their health insurance. 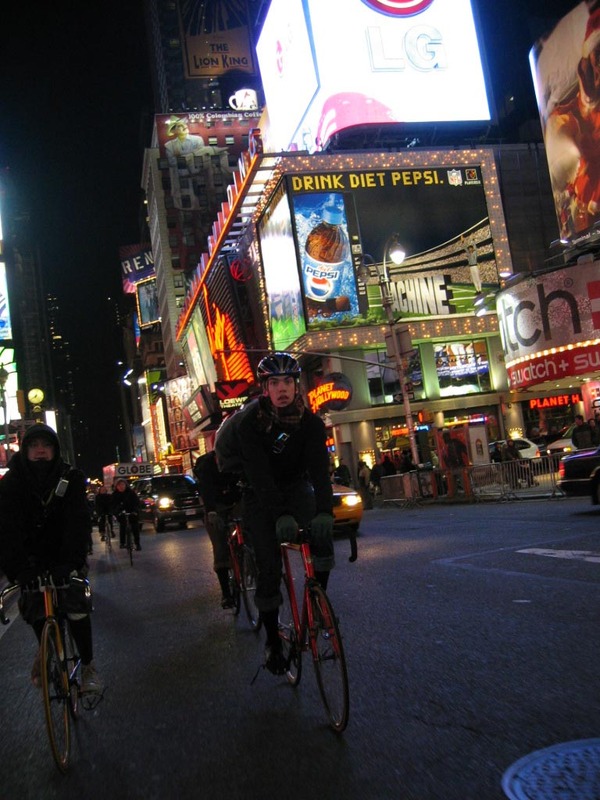 Last night we had an evening commute bike-pool from Columbus Circle down to Houston. We started out with about 7 people and had the sound bike from time's up along so we could have a little bit of tunes for our ride home. 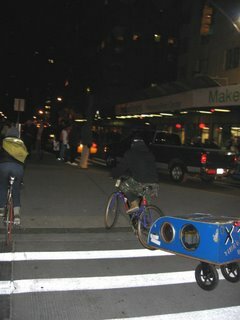 We rode down the closed off 5th Ave and waved to people walking home. 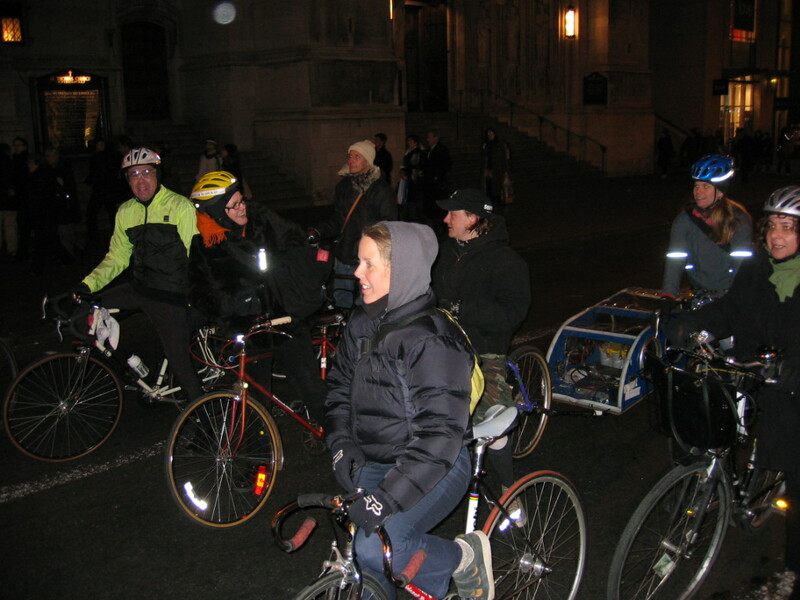 Many of those walking in the cold, cheered us and we began to pickup other bikers. 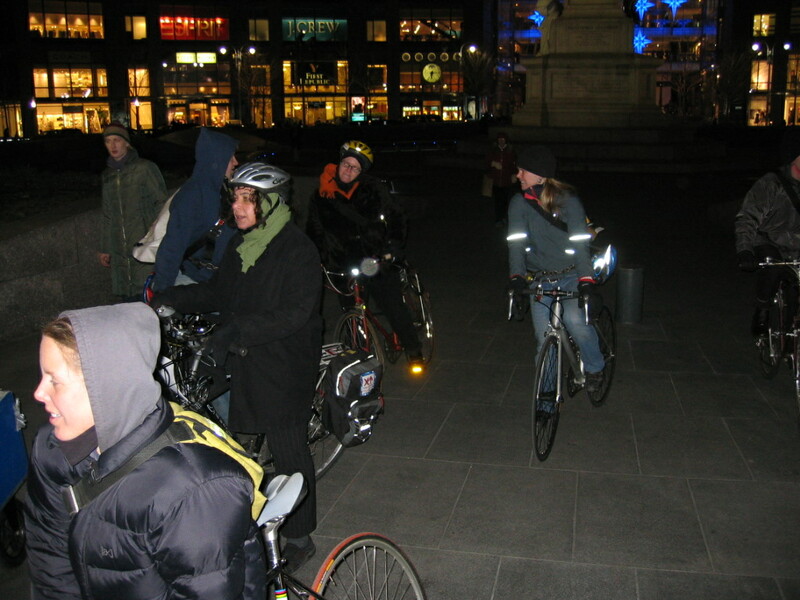 By Union Square we were about 15 riders. 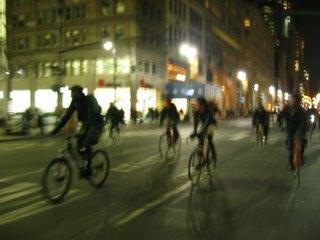 Someone had heard the rumor that there was a Critical Mass planned for the evening, leaving the North Side of Union Square around 7:00pm. We doubled back and waited in the park. We had a small contingency of about 15 riders and we used the opportunity to make a small tour of midtown. After a brief bike-raise in Time's Square we headed down 7th Ave and off in our own separate directions. 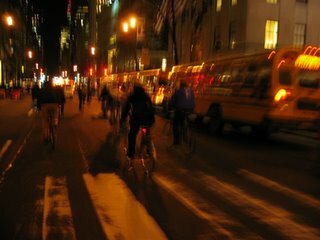 There are more planned bike-pools for today, including another evening ride scheduled for 6pm at Columbus Circle. Go to middle round island and look for fellow cyclists. There were no hooting horns and buses plowing you into the sidewalk. No cabs and delivery vehicles jamming up the bike lanes. The Bloomberg administration's overkill restriction on cars—each had to have four people to get into Manhattan—was intended to ensure that emergency vehicles weren't hampered during the strike by a traffic jam, but it instead made traffic in many places lighter than on most Sundays. For people like me, who've made bikes our primary mode of transportation in the city, yet who now find the streets ever more cluttered with trucks, limos and oversized SUV's, the strike was a chance to test our fantasy of riding in a car-free Manhattan. For once, we weren't second-class commuters. Indeed, the city went out of its way to accommodate bikers, setting off existing bike lanes with orange cones to stop drivers from double-parking in them like they usually do. Some streets, like Fifth Avenue and Madison Avenue between 23rd and 96th Streets, were off-limits to anything but emergency vehicles and charter busses. 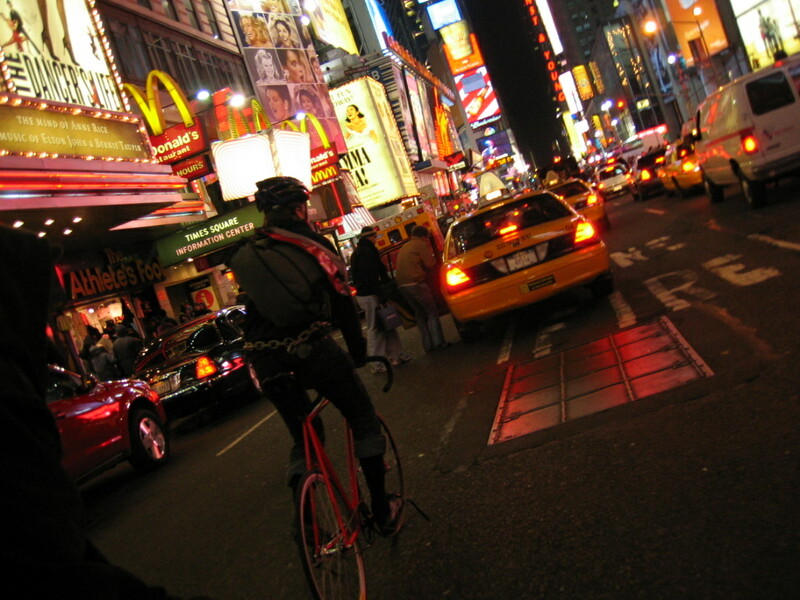 At the height of rush hour, I managed to ride all the way up Fifth Avenue from 23rd Street to Times Square without stopping once. And the cops posted on the side streets to keep cars from turning onto the avenue didn't stop me once for riding the wrong way. "It reminds me of September 11. It's eerie," said David Munroe, a 32-year-old IT administrator pedaling up Fifth Avenue. "The streets are quiet and it's calm everywhere. The pedestrians have the run of the city, which is highly unusual." Daniel Pagano, who regularly rides to his job near City Hall, was also pleased by the ease of getting around. "I bike every day, so I think it's great, and I think more people should advantage of this as an opportunity," said Pagano, pedaling his 10-speed down down an entirely car-free bike lane on Second Avenue. "It's a good way to save energy, and it's good for the body. Americans are overweight so I think the city could do a lot more to encourage people to bike and walk more," Pagano added. On Broadway south of 14th Street, police working the strike carved out a traffic lane for bikes. "Look at that, a whole car lane blocked off for riders. 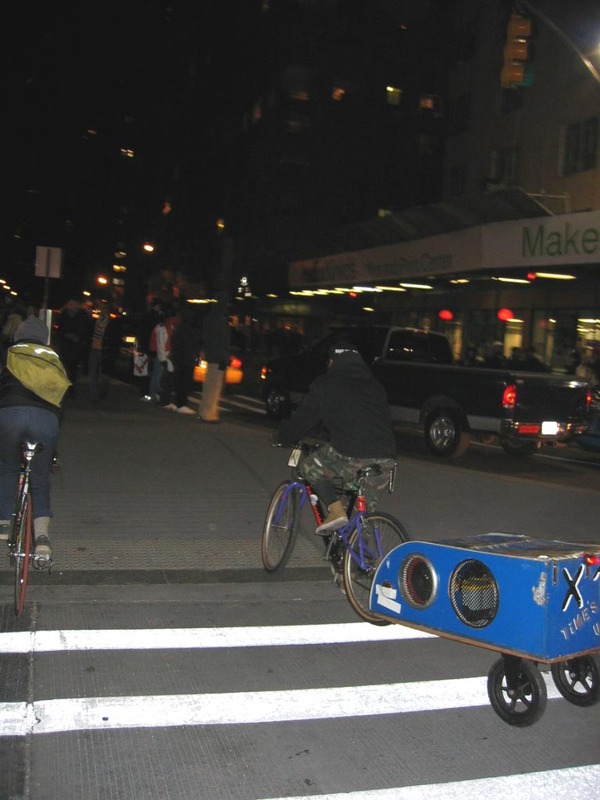 That's so cool," marveled Todd Vanderlin, a 22-year-old art student who was slaloming down Broadway on a skateboard. And for the bike messengers and pedicab drivers, the strike made their jobs a breeze. "It's better if you ask me—there's no pollution," said Mike Nelson, a 52-year-old bike messenger from the Bronx. Nelson said he thought the city should consider keeping more streets permanently off-limits to cars in Midtown. "It would be better for the city and better for the air," he said. "But rich people with their cars aren't going to want to hear that. They don't want to give up their warmth and comfort." Of course, for many, going on two wheels was not the optimal way to get around. Anthony Rodriguez, a 22-year-old history student at the Borough of Manhattan Community College, said he walked from Ozone Park Queens to East New York to borrow a friend's bike, then pedaled slowly for an hour into Manhattan "because I have no brakes." Thanks to the frigid temperature (the wind chill at around 8 a.m. made it feel like it was 13 degrees outside) there were far fewer folks biking than one might have expected. Some who did venture out said they weren't all that happy about it. "Other than the fact that I can't feel my toes and I'm three hours late because my babysitter was two hours late, it's great," groused Julie, a 39-year-old fashion designer, who declined to give her last name. "I don't have the clothes for biking in the cold like this. I'm in fashion, so I have to dress. Normally I wear heels," she said, shivering in the nylon running suit with many layers piled underneath that she'd put on for the ride in from Brooklyn. Others said the strike had inspired them to rethink how they commute. Nick Fereday, a 38-year-old economist, went out and bought himself a $400 Trek to get from Carroll Gardens to his desk job at Columbus Circle. "I think it's amazing, Ithink more people should bike like this," he said, strolling off the Brooklyn Bridge, where cops were making bikers dismount because of the crowds of pedestrians. Fereday said he hoped to make biking part of his regular routine "because otherwise, at $400, that would be a pretty expensive commute." Fereday said he was surprised at the go-to spirit he encountered among other Brooklynites coming across the bridge. "As a runner, going across the Brooklyn Bridge can be a nightmare with all the pedestrians in your way and having the bike lane closed off for bikers. But here everybody's walking wherever they like and nobody's getting annoyed. It's like the blackout. People just dig in and get into it. I think crises like these bring out the best in people." Politics has always been largely a matter of self-interest. 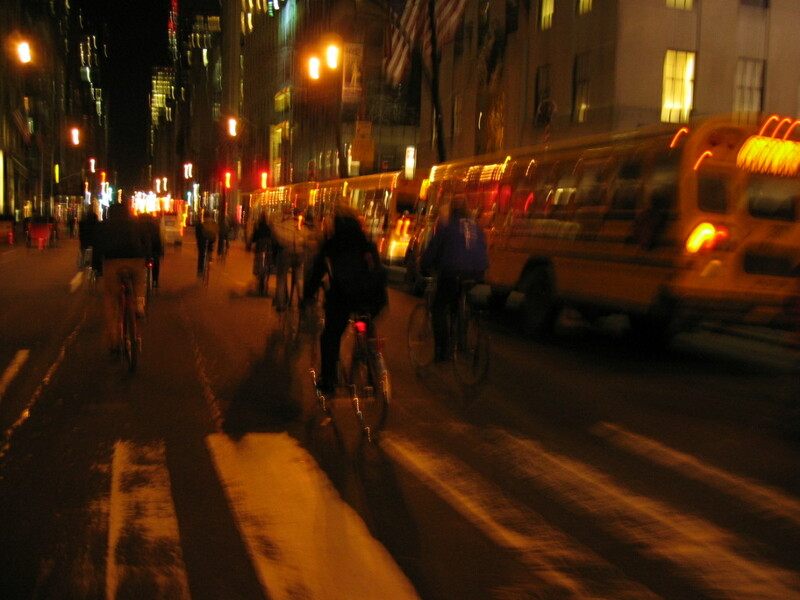 So perhaps it's not surprising that those who had the option of biking seemed to take the strike in stride better than those who froze their feet walking or waited for hours in the outer boroughs to get on a Metro North or Long Island Railroad train. "I definitely support the strike, 100 percent," said 38-year-old George Hall, a computer consultant, who was rode an old Univega 10-speed across the Manhattan Bridge from downtown Brooklyn. He opposed MTA management's demand that the retirement age move from 55 to 62. "What is this, a race to the bottom to see how old people have to be to retire? As a union, they need to be setting the tone for the rest of us. Especially when you look at all the discrepancies in the MTA's finances that we've seen over the last year. They had to take a stand, and I support that." But would he keep biking once the strike was over. "No, are you kidding? I smoke two packs a day." 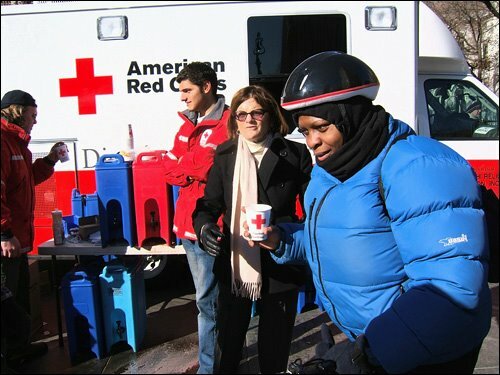 Oh, look it's recently elected public advocate Betsy Gotbaum hanging out with the red cross. She must be thinking: "Damn all these bikes on the street, if this were only critical mass I could have them all locked up!" Been cycling to the office the last 2 days - from downtown to midtown. Yesterday took Park pretty much all the way - traffic got pretty dense around 34th St. This morning I decided to get onto Madison at 24th St. It was great! Only a few emergency vehicles and the occassional private bus. Pretty much open road all the way uptown! Lots of other cyclists (going both directions) there. Will give 5th Avenue downtown a try for the ride home. Definitely a lot of "first time" cyclists out there. Lots of poorly inflated tires, seats too low and folks just pushing the bike at points. Maybe we'll have a few more cycling commuters when this mess is over. And we're all saving a few $ a day as well. DAMMIT JIM! YOU CUT OFF MY RED SOCKS! IM WEARING RED SOCKS IN THE PICTURE! ARRR!! NEVERTHELESSS STILL I RIDE! I AM A MASS OF ONE! WAIT THERE IS NO I IN CRITICAL MASS.. ITS ABOUT THE PEOPLE... WAIT THERE IS AN I IN CRITICAL MASS HA! STILL I RIDE! WOOOT! TWU strike? Ride a bike.